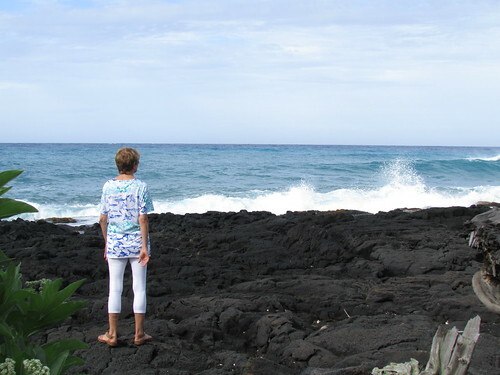 I know some of my readers are interested in knowing what happened here on the Big Island when Hurricane Iselle hit this past week. 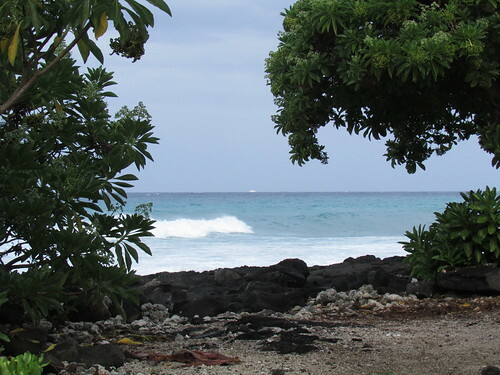 Fortunately, I live on the leeward side of the island with two mountains dividing us from the windward side. 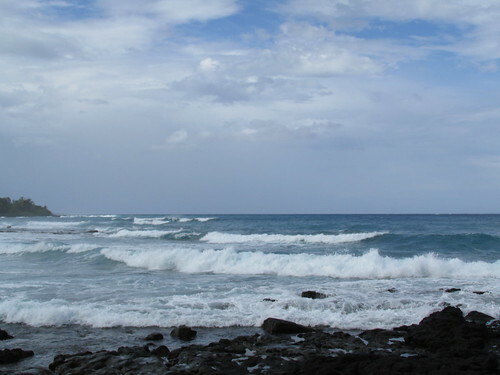 Iselle’s landfall was in Ka’u District, where Ocean View, Na`alehu and Pahala are located, creating lots of flooding and loss of trees. 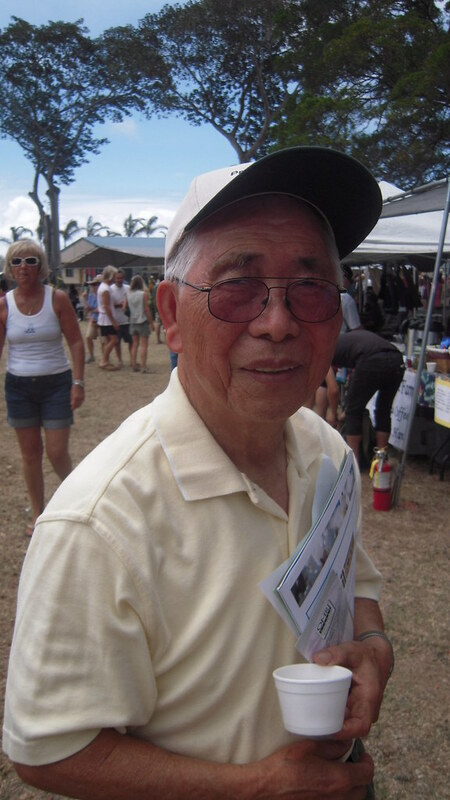 It seems the biggest damage, however, was in the Puna District. 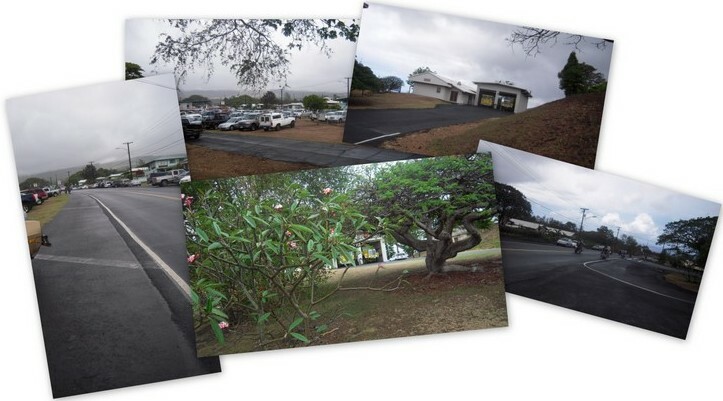 Here is a link to some of the pictures showing the results of Iselle there. 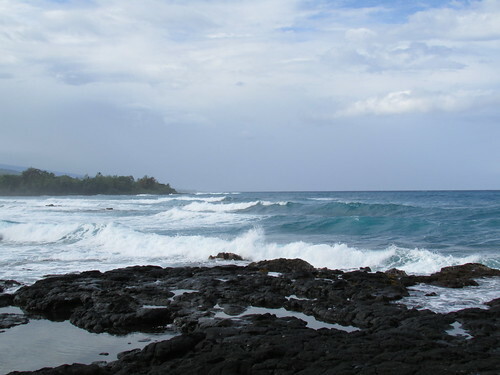 The morning after Iselle hit, I walked with some friends visiting from California on the beach just below my home to see the surf. The pictures on this post are from that walk. We got rain earlier that morning, but it was nothing like what I had expected. A little later in the morning, we got quite a wind – so much that I almost had white caps on my pool! Other than that, we were not hit at all. Many of my friends were not that fortunate, and too many are still without power and phone. It’s a miracle that people lived through it all. 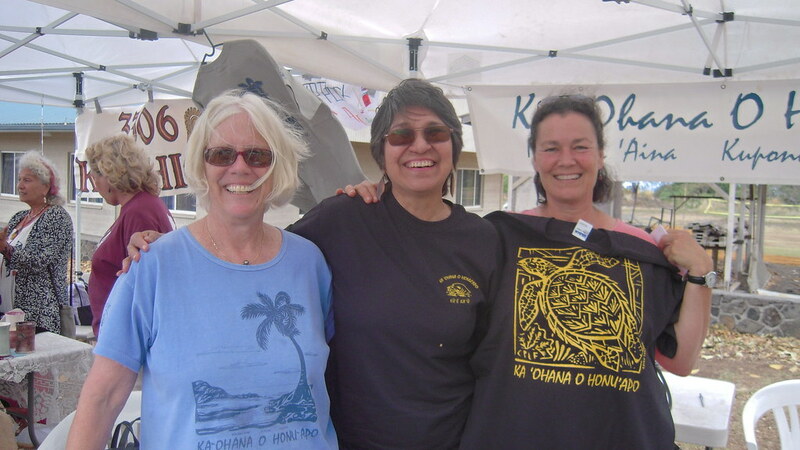 Mahalo for all the thoughts and prayers that came to our island! Right away, I headed for the food booths. 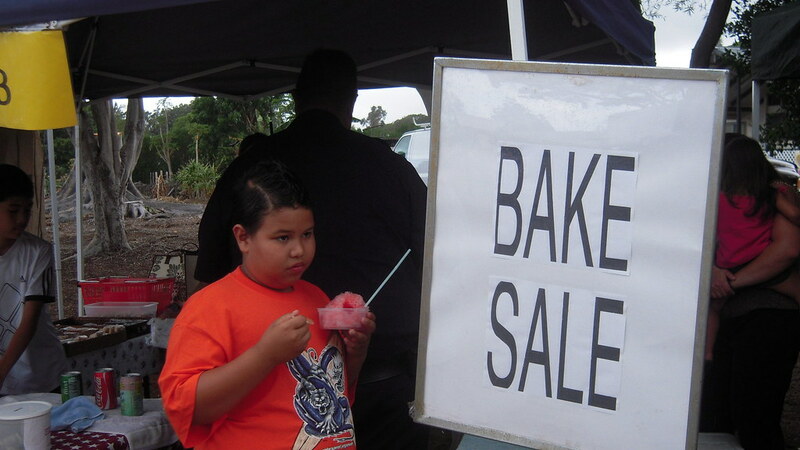 I know how delicious Pahala foods can be! 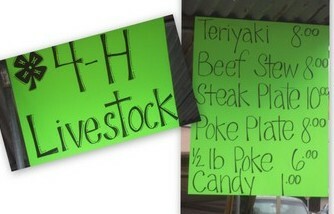 The 4-H booth served beef plate lunches from home-grown beef. 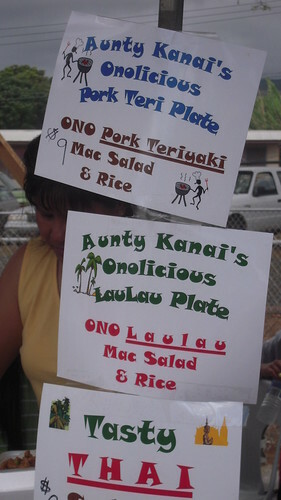 Typical local-style plate lunch is a meat, “two scoop” rice, and macaroni salad. 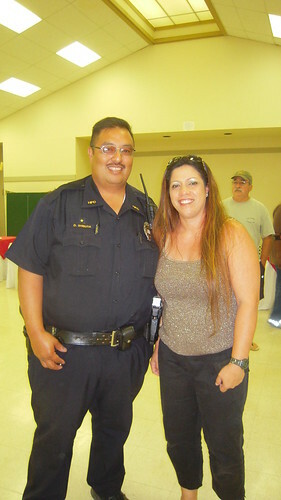 Dane and Terri Shibuya are good friends. Dane is the Community Policeman for Ka’u District. They are also owners and operators of Masazo’s Pig Farm. Their oldest daughter was missing in this Shibuya family photo, because she is on the mainland working on a graduate degree. Their daughter Brandi was First Princess of the Ka’u Coffee Festival. After a huge plate lunch, it’s time for dessert! 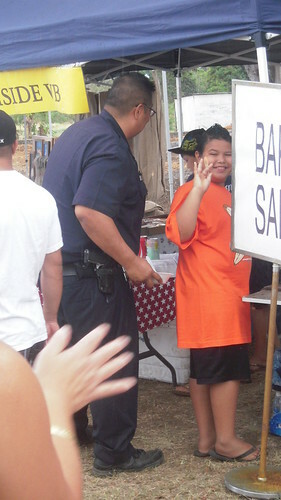 Is that a “shave ice” he has? Honu`apo, a local beach also known by some as Whittington Beach, had their own booth . . .
. . . and the women working the booth showed off their beautiful shirts. The profits go to return the beach to its original state. 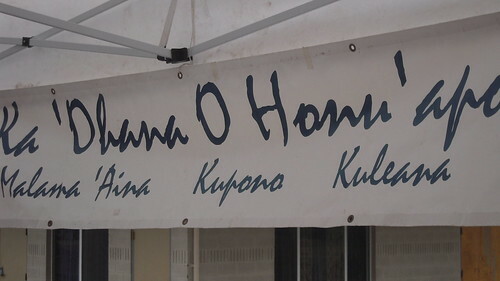 New plans are underway to continue renovation of Honu`apo. For a previous post about Honu`apo, click here. 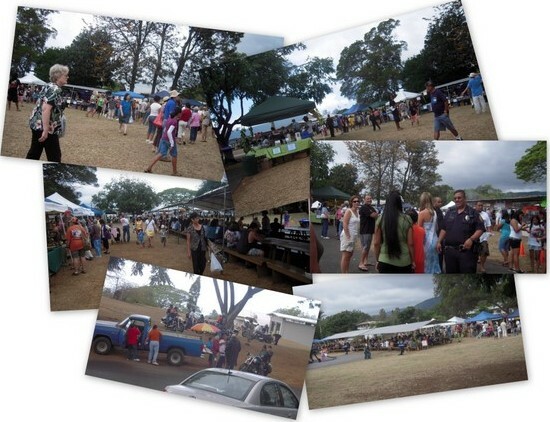 There will be a special ho`olaule`a (festival) on Labor Day Weekend, 2010 at Honu`apo to celebrate. Watch for more information. 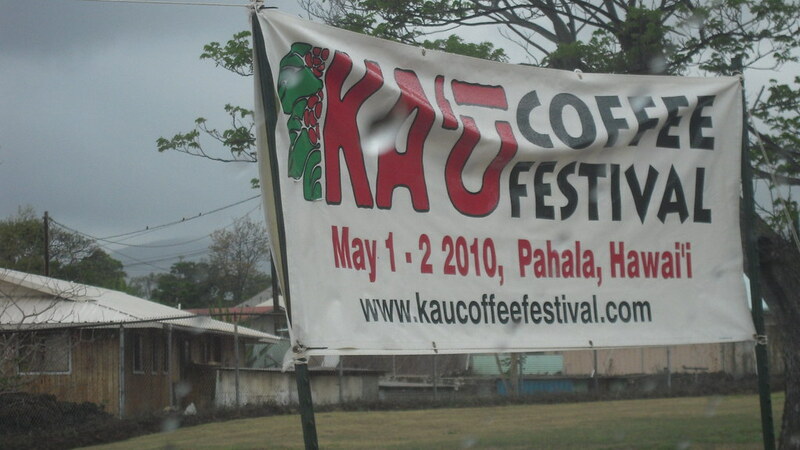 The Coffee Festival brought out folks from all over the island, and probably elsewhere. 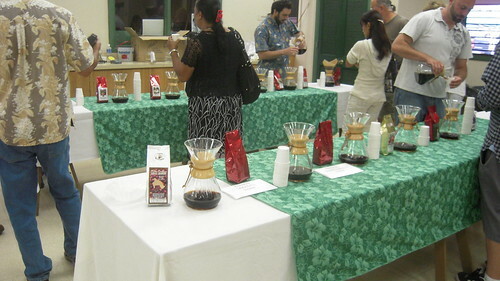 Inside the exhibit hall . . .
. . . various coffee growers had their coffees on display and available for tasting. 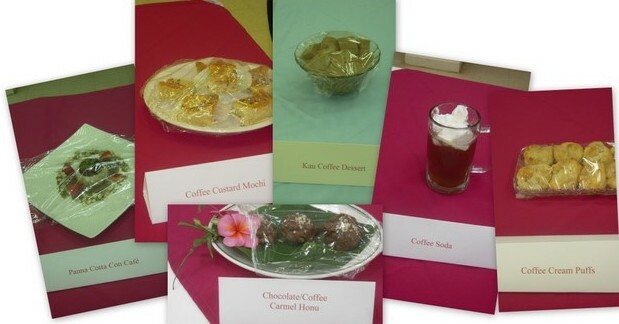 There were also displays of foods by local culinary students and chefs. Be sure to look at the slideshow at the end to see each of these individually, and read the names of the dishes. It’s too bad they weren’t available for tasting! I’d love to have some of these recipes. Other booths featured crafts, some decorated with traditional Hawai`ian designs . . .
. . . and various items made from coffee bags. 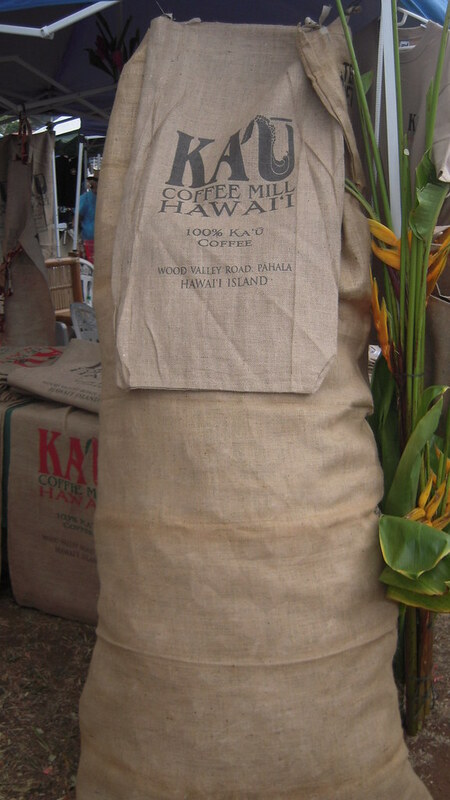 Ka’u coffee is quickly taking over the Kona monopoly in flavor. If you get a chance, be sure to try some. I had a chance to visit with my friend, Kazu, who caught me up on various other people who had been members of my church there in Pahala. 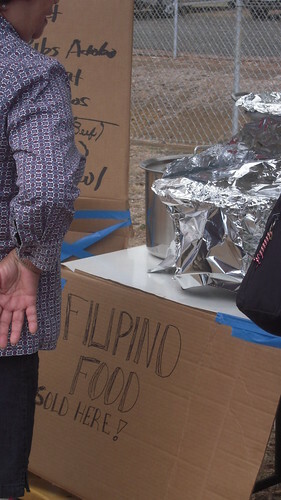 There were “choke” (plenty) food booths. You can tell the people of Ka’u love to eat! 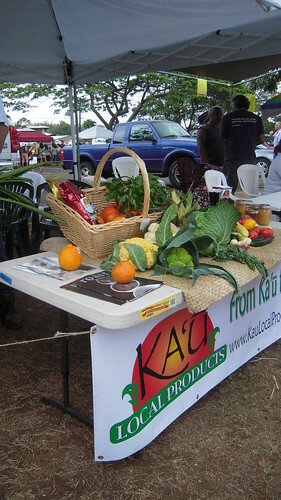 Here is a luscious display of local Ka’u produce. 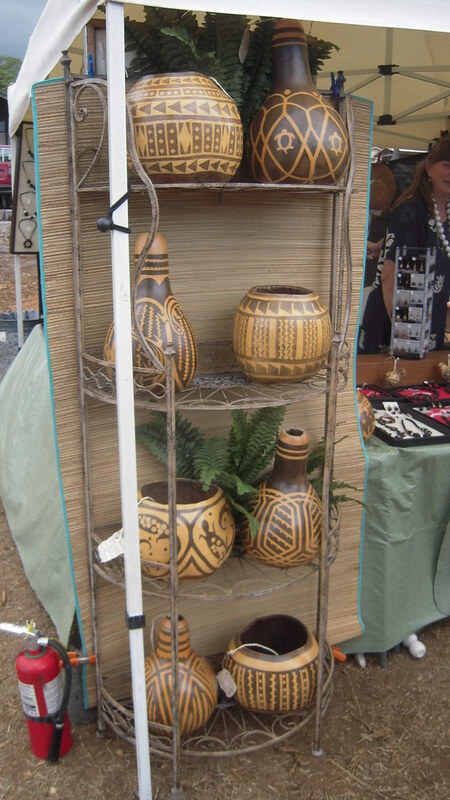 The weekly farmers’ market is usually loaded with wonderful fruits and veggies, homemade breads and more. No gathering in Hawai`i is quite complete without a good local band. Pahala is a small sugar plantation village. 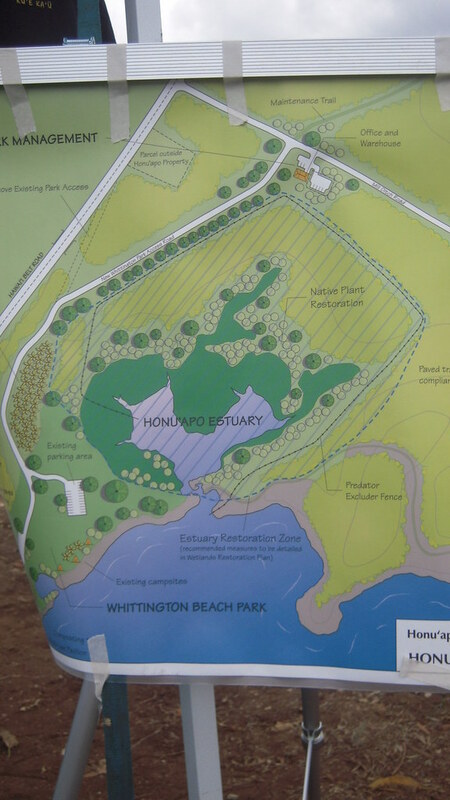 When I moved there in early 1996, the plantation had been closed less than two years. They seem to have rallied over the years. 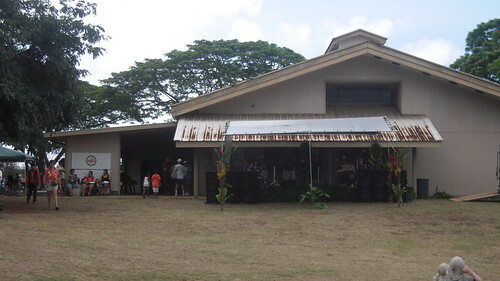 If you are driving around the Big Island, be sure to stop and visit this historical spot. 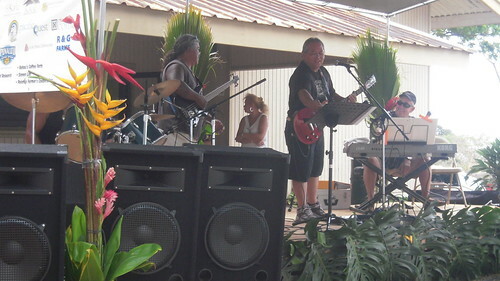 To see individual pictures of all these photos, view this slideshow. Click here for a larger view of the slideshow. You will be rewarded!